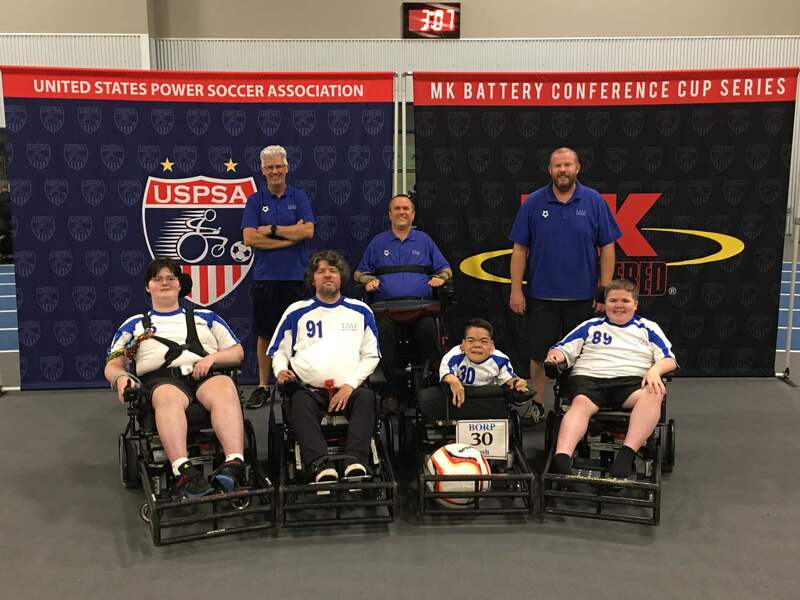 The US Power Soccer Association (USPSA) hosted the 2018 MK Battery Conference Cup Series, a national power soccer tournament, in Fort Wayne, Indiana, June 28 through July 1. 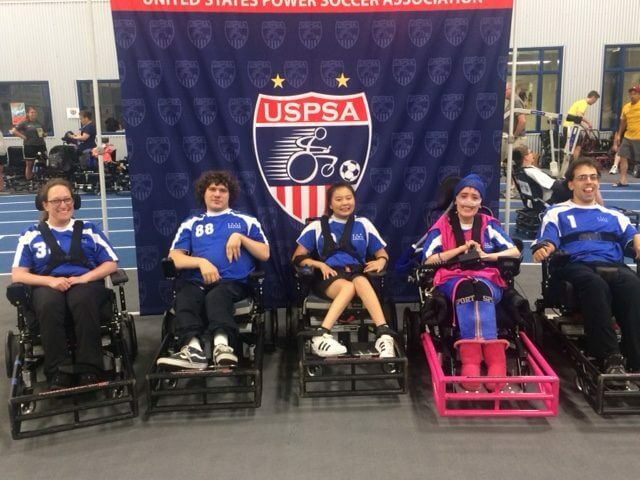 The BORP power soccer program sent two teams to the tournament: The Crushers and the Shockers. The tournament was held at the Turnstone Center which is a beautiful Paralympic certified training facility. Thirty-five teams from four different divisions participated in this week-long event. It was the first time all the teams were able to compete and be under the same roof at the same time—that alone was awesome! In order to accommodate all the teams, the Presidents and Founders Divisions (third and fourth divisions respectively) started a day before the Premier and Champions Divisions (first and second divisions respectively). The Shockers are in the Presidents Division and played three games on June 28, the first day of the tournament. Most of the players traveled the day before and with the three-hour time difference I believe that may have been a factor in their slow start to the tournament. The first two teams capitalized on some mistakes that we made early on and scored several goals each which proved too much for us to come back from. After a little pep talk, some coffee and a little fuel from lunch the Shockers came back and won their third game, finishing third in their pool of four teams. The second day of the tournament began with another early morning start for the quarterfinals and the Shockers lost a close one but came back with a vengeance to win the next game, putting them in the fifth place game going into the third day of the tournament. The Shockers started out a little slow in the first half of their final game on day three, which resulted in two quick goals for the opposition. With ten minutes left to go in the game we scored our first goal and kept putting more and more pressure on but just couldn’t break with the tying goal to send it to overtime. The Shockers finished in sixth place out of ten. One of the highlights for me was seeing the players transition from sleepy and passive, to the most tough and aggressive I have ever seen them play. Hopefully at our next tournament we will be able to start there from the beginning! Also, Ian Kinmont was nominated to the all-tournament team. The BORP Crushers started their three-day stint on June 29. Luckily none of the games for each BORP team conflicted making me choose which team to coach. In their first game, the Crushers came out and scored a quick goal on a corner kick with Jake Bath sneaking the ball directly into the goal between the two defenders. The final score was 1-0. The second day they played three games starting at 8:00 AM. In their first early-morning game they went down 0-1 in the first half but rallied to win the game 3-1 showing much resilience. They went on to go undefeated in pool play and getting a quarterfinal bye. The team was extremely excited about this especially because we had just moved up to this upper-level division after winning the lower level tournament last year. This also meant that on our first game on day three was at 11:00 instead of 8:00 AM, giving us much needed rest. Many of the teams were confident that we would do well because we were playing an aggressive style of play by always playing our goalie up court and having them intricately involved with the flow of the game versus keeping them planted in the goal. We call this the four-up system, and none of the teams have ever seen it or played against it. In the semifinal game despite our extra rest, we played a little sleepy and passive which the opposition took advantage of scoring two quick goals in the first five minutes. After that, we woke up and dominated possession and play throughout the rest of the game but were only able to score one more goal even though we had multiple chances. This put us in the third-place game where again we started out a little slow and came on in the end and lost 2-1 finishing in fourth place out of ten. After starting the tournament so great the players were a little disappointed with a fourth place finish with their eye on winning it all. But after being promoted from the lower division up to the Champions division with much more competitive teams, the result is very respectable as most teams struggle with the promotion. From the experience the team definitely learned a lot, identifying areas we need to work on for next year to take home the title. Also, Calum Cain was nominated to the all-tournament team. Overall it was a great tournament for both teams. They played hard, progressed and developed a lot, both individually and as a team, and learned a lot about how to deal with the agony of defeat. I’m proud of both teams and appreciate everyone’s hard work. including the parents, volunteers, and personal care attendants who help make the journey and experience as seamless and enjoyable for the athletes. We’re looking forward to next year and continued improvement. The BORP power soccer program would especially like to thank all the people who donated and assisted in the fundraising with the poker fundraiser to make it possible for us to attend. We are already looking forward to next year! Click here to see more pictures from the tournament taken by Scot Goodman.